Thinking About a Winter Driving Course? Do It! I’ve always been nervous about winter driving, especially after being involved in a few near misses and one accident that totalled the car. So when I heard a few years back that Mercedes-Benz ran a winter driving academy, I was interested. The fact that you got to drive several of their cars during the course of it made me even more interested. But it looked rather expensive, and I wasn’t sure I could justify it. Last Friday, I got to go to the Mercedes-Benz Winter Driving Academy (MBWDA), courtesy of my husband who thought it would make a great Christmas present. He was right, and having been through the experience, I have to say that it is worth the money. While they do run courses in various places across Canada (you can find more information here), obviously space is limited. I’m guessing, however, that other winter driving courses do offer some of the same training. Ask around and see. What should you expect? At the MBWDA, we started out in the classroom, where chief instructor Danny Kok talked about in-car stability programs (ESP), ABS brakes, and skids. While I never felt I was being talked down to, his explanations were clear and easy to understand. He also discussed such things as seating position, mirror position, eye and hand position, and I discovered there were a few things I’d been doing wrong since I first started driving. I wasn’t alone. Then it was down to the ice (really! 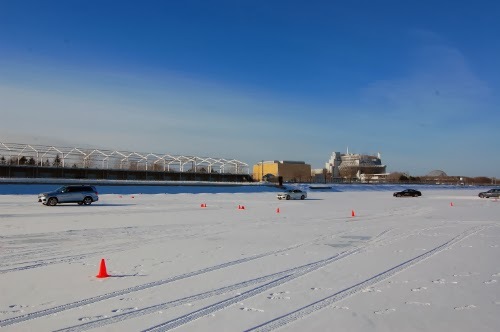 We were on the rowing basin from the Montreal Olympics) where we got to put all the new information to practical use as we ran slaloms, practiced emergency braking and cornering, and front and rear skids, with and without the ESP system. Don’t know about you, but normally I tend to panic if the car starts going off in a direction other than where I pointed it. On the ice, doing it deliberately, I was fine, as I knew there was nothing for the car to hit. For any other women reading this, yes, I was somewhat worried about being intimidated by the instructors and my classmates. Not being particularly assertive, I figured I’d be stuck with the smart fortwo all day while my classmates fought over the sports cars. Nope. The course is designed to make sure you have a chance to try all the cars and no one was the least bit intimidating. The instructors were great at providing feedback and letting you know not just what you were doing wrong but what you were doing right. There goes the rear end! Getting to try the fleet of cars was a blast. The instructors had various vehicles picked out for the different exercises and cycled us through them. It was interesting to try rear wheel drive, front wheel drive, and all wheel drive (4MATIC) on the same exercise. Definitely felt safer in the 4MATICs but the rear wheel drive cars were more fun. They also had one E 250 equipped with all seasons and another with winter tires. Winter tires are worth the extra money. The icing on the cake was getting to drive the C 63 AMG coupe and the SLK 55 AMG roadster. I was drooling just looking at them, especially the SLK. Mmm. They both have a lot more power and response than I’m used to (they have more than twice the horsepower of my daily driver). I’d have to describe them, especially the C 63, as frisky. Not a bad thing, but I’d want several hours on clear roads under my belt before I took either of them out in a snowstorm. Now all I need to do is find an empty parking lot so I can get in more technique practice. I had a look at one of my favourite websites, the Internet Movie Cars Database, and sure enough, they have a photo of the car in question though it’s hard to tell if Ms Lansbury is behind the wheel. Looks to be the same colour as the one at RAM. Wikipedia describes the movie as a film noir. I won’t spoil the plot for you if you haven’t seen it, but it’s available for free download at the Internet Archive. Thinking of having a look for myself, to see how much the car figures in it. 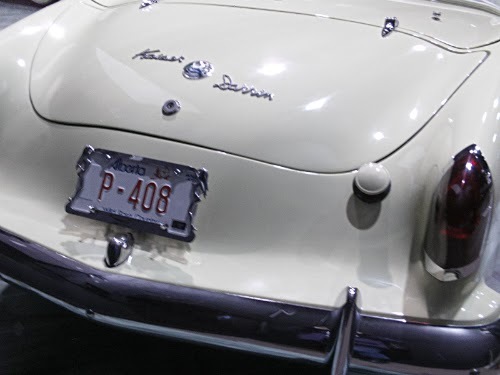 One of the rarer cars currently on display at the Reynolds-Alberta Museum (RAM) is probably this 1954 Kaiser-Darrin (Model K452). 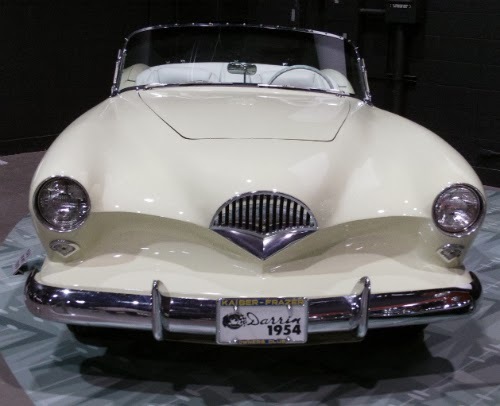 Designed by Howard “Dutch” Darrin* for Kaiser Motors, this two door convertible was the first American car to have a fibreglass body. It also has pocket doors, which I think is amazingly cool. Meant, like the Corvette and the original Thunderbird, to compete with European sports cars, the Kaiser-Darrin was, according to Wikipedia, overpriced and underpowered, with only a 161 cubic inch six cylinder which put out 90 hp. The display plaque at RAM says the original cost of the car was $3,653 US. How Stuff Works says that was more than a Lincoln Capri or a Cadillac 62. 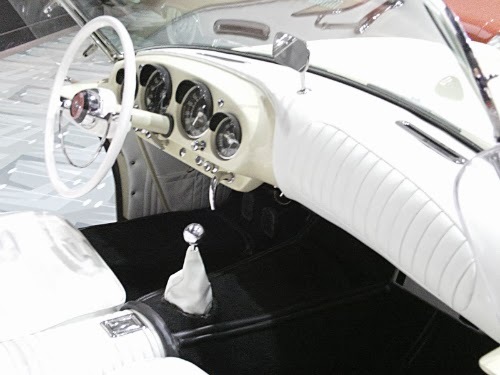 The car still might have made it—after all, How Stuff Works says the original Corvette was also overpriced and underpowered--but Kaiser itself ran into trouble before more than 435 were built. Darrin got his hands on several (about 100) of them, added bigger engines (304 bhp Cadillac V-8s) and resold them. Some 300 of the original 435 Kaiser-Darrins are still around, so obviously somebody liked them. The one at RAM hasn’t been souped up, and still has a 161 ci six cylinder under its hood. Unlike when it was produced, it’s now a valuable car, if this ad on Hemmings is anything to go by—asking price on a beautifully restored stock 1954? $225,000. Pity, I’d rather like one. Well, there’s always space in the virtual garage. * Hemmings Classic Car has an article on Darrin’s career here. Copyright 2014 Chrysler Group LLC. The logo will be found on various items for sale at WearMopar.com. Despite the website’s name, there will be other items besides clothing, including coffee mugs, key chains, a special edition license plate, and even a Man Cave sign. Events are also in the works, but have not yet been announced. So why is the second gen HEMI so legendary? Here’s a little back history, courtesy of Chrysler Group LLC. 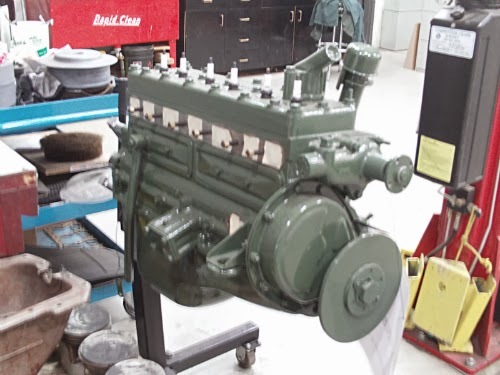 The first hemispherical combustion engine (hence the name, but I’m sure you knew that already) was designed for passenger cars and was first used in 1951. That’s not the one that’s famous, though. 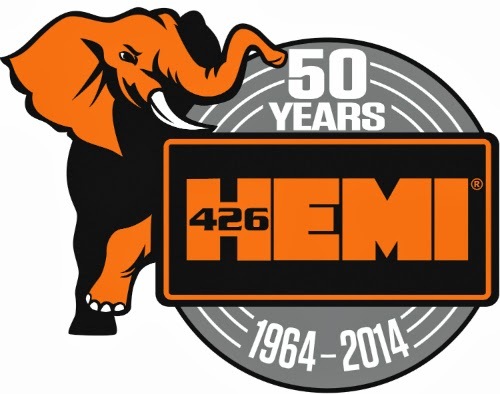 THE HEMI, a 426 cubic inch beast, was designed for race cars and came on the scene in 1964. Actually there were two versions, one for circuit racing and one for drag racing. They both had a spectacular first season. The track version was first used at the 1964 Daytona 500. Richard Petty took the race in a HEMI-powered Plymouth, and three other HEMI cars were in the top five of that race. Off to a good start. Petty went on to win seven more races that year and the NASCAR championship. Meanwhile, Don Garlits, also using a HEMI, ran a quarter mile in 7.78 seconds during a National Hot Rod Association drag racing competition, reaching 201.34 mph. All looked good for the HEMI but NASCAR changed the rules for the 1965 season, so that only engines available in production vehicles could be raced. Maybe they were afraid Chrysler wouldn’t have any competition. So no HEMI in NASCAR that year, but the net result was that Chrysler brought out a street version of the HEMI in 1966. And the rest is history. Of course, HEMI-powered cars continued to burn up the track, but the HEMI also became a muscle car legend. 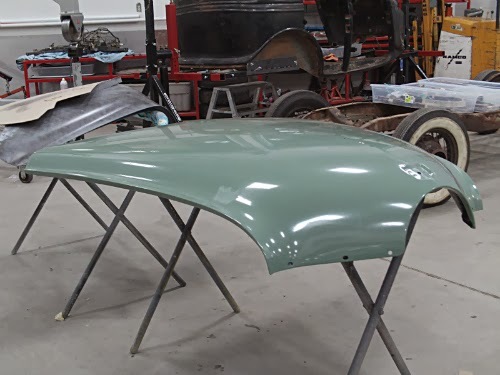 As promised, here are more photos of the 1951 Studebaker Champion currently being restored at the Reynolds-Alberta Museum. First a shot of the hood, since it’s been painted, to give an idea of what the finished car will look like. Considering the way fashions continually recycle, I wonder why pastels have never come back for car paint colours? And here are some shots of the body and chassis, mostly assembled. 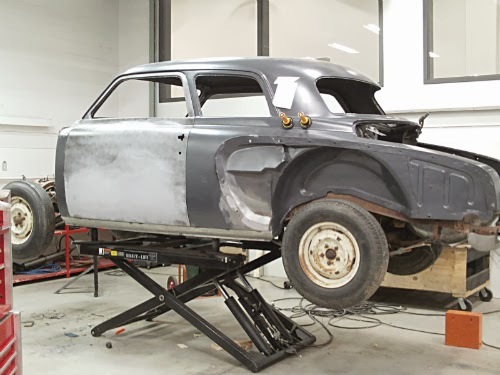 Hagerty’s offers a short history of the 1947-1952 Studebaker Champions. Yes, the 1951 is one of the famed bullet-nosed models. For more details on specs, check out How Stuff Works. I promise I’ll get back to the Studebaker, but in the meantime this crossed my desk. 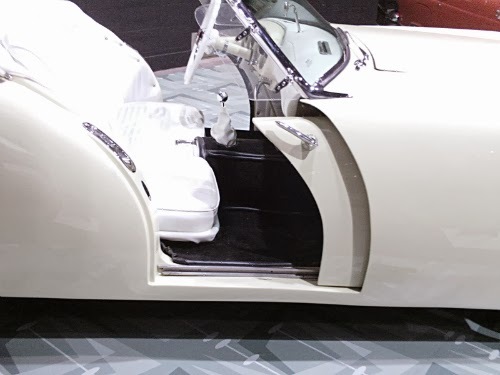 Seems Barrett Jackson will be selling off Simon Cowell’s 2008 Bugatti Veyron 16.4 at their Scottsdale auction which runs from January 12 (tomorrow) to the 19th. The Bugatti is lot no. 1319.2 but I can’t find anything online to indicate which day it will actually be auctioned off. My guess would be one of the three weekend days, probably the last one. 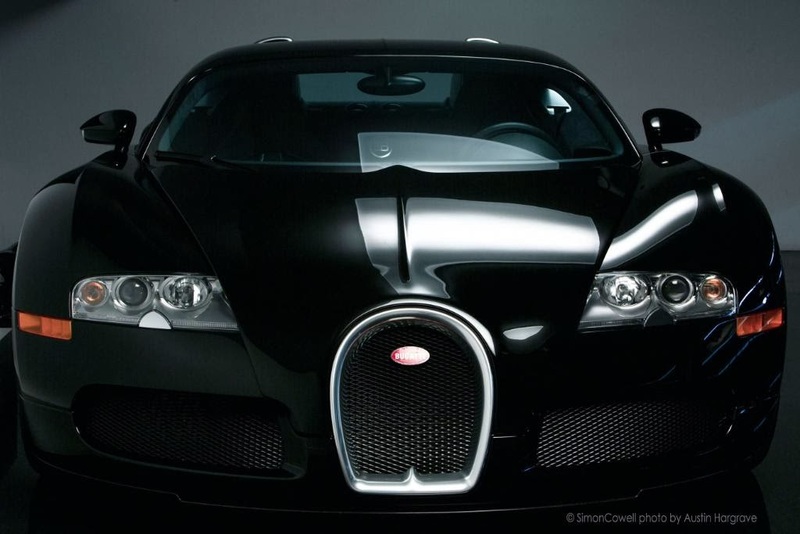 factory warranty offered directly through Bugatti. Needless to say, there is a reserve price on it. More details on the car can be found here. For those of us who can’t get to the auction (yup, that includes me), there will be coverage on some of Fox’s channels, plus the National Geographic channel, from the 14th on. You can also access live streaming online by registering with Barrett-Jackson. 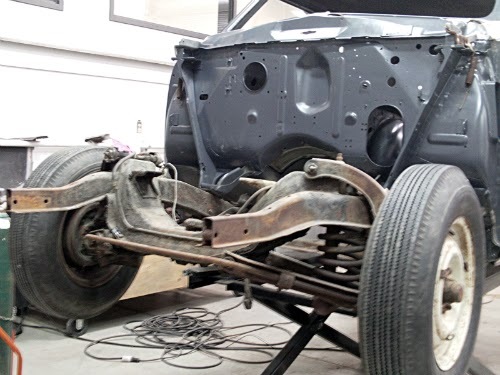 Here are a few photos of the Studebaker I saw in the RAM restoration shop over Christmas. Looks like a project that should keep them busy for some time. If you’re interested in taking courses on restoration, the museum runs workshops every February—more info here, though it might be too late to get into this year’s courses. can be seen on the right side, about halfway up. Engine for the 1951 Studebaker. 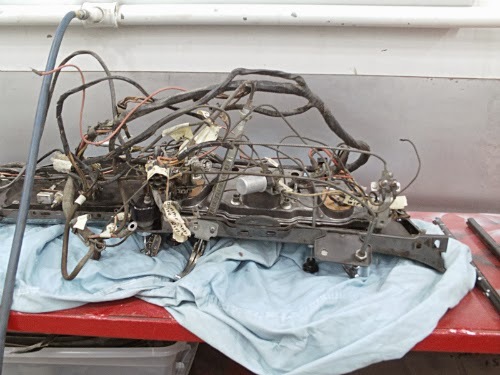 Wiring harness for the 1951 Studebaker. Yikes! I’ll post a few more photos next week. Back in 2010, when I was writing my first blog for the Montreal Examiner, I did a story on the race between Bentley Boy Woolf Barnato and his Bentley Speed Six and the Blue Train from Cannes to Calais. (You can see the article here but the site does tend to be ad heavy.) The topic’s interested me ever since, so when YouTube emailed me a link to a video called “On the trail of the Bentley boys in the Bentley Blue Train,” naturally I had to take a look. It does have some lovely footage of a 1930 Bentley Speed Six tooling around London to various sites related to the Bentley Boys, including the location where the body of the car in the video was most likely built. Sweet, eh? Only one problem. Some of the comments under the video claim that the car in question is NOT the car that Barnato drove in his famous race. According to Wikipedia, (Blue Train Bentley controversy), Barnato owned two Bentley Speed Six cars. The first, a formal salon with body by H.J. Mulliner, was the one he drove in the March 1930 race. The second, a sportsman coupe with body by Gurney Nutting, and the car featured in the video, wasn’t even delivered until May of 1930. The confusion started because Barnato dubbed it the “Blue Train Special.” Confusion which apparently extended to Bentley itself, which used the car in material celebrating the 75th anniversary of the race. 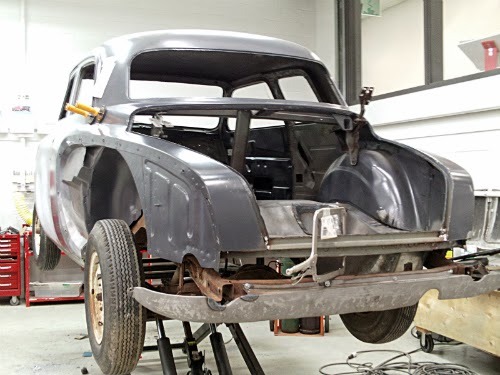 For more details on the unravelling of the story and the race itself, see http://www.classiccar.co.nz/articles/barnato-bentley-and-the-blue-train-mystery-190. The Bentley in the video may be the wrong one but it’s still one sensational car. 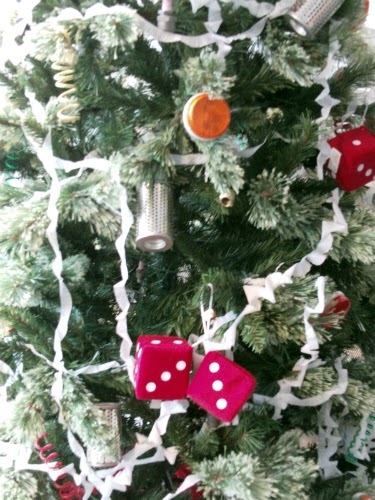 Happy New Year to all my readers! Hope you had a great Christmas break and that it somehow involved classic cars. Mine certainly did, as I toured the Reynolds-Alberta Museum in Wetaskiwin while I was off. Not the first time I’ve been there but there’s always something new to look at. 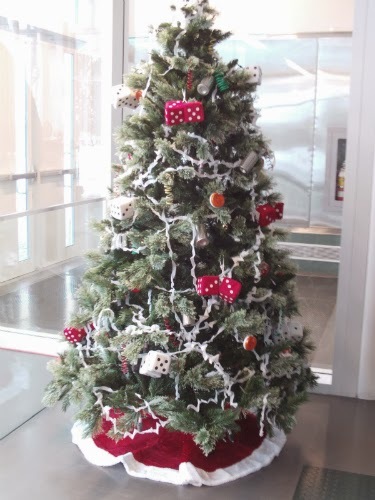 Thought you might enjoy a picture of their gearhead Christmas tree. 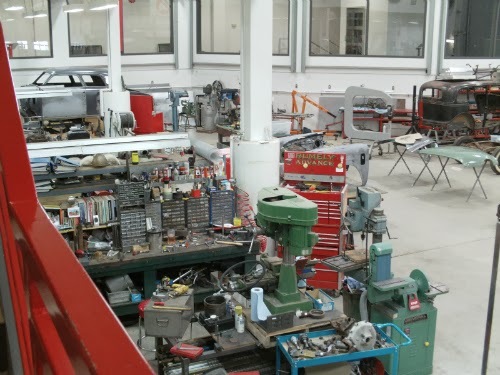 Also had a chance to look over their restoration shop while I was there. I’ll be posting pics of one of the projects they’ve got in the works later this week.